I have to say that the quest for the perfect pilgrim hat introduced me to a lot of lovely people. Thanks to the people of the ~silentsparrow~ group for pointing me at various hats. 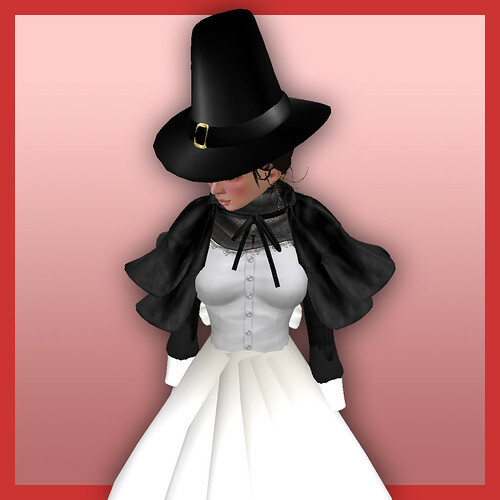 Allegory finally mentioned the Illusions group gift from a year ago, and I put it on -- ah, perfect, the pilgrim's wife is borrowing her hubby's chapeau! I hear a rumor that Siyu might just give a lovely hat like this to her update group today. Wahaha. I just figured out that the Edelweiss outfit comes with a few animations and gestures, including one that makes the poor maid explode -- to match her thigh-strapped cherrybombs. Neat. 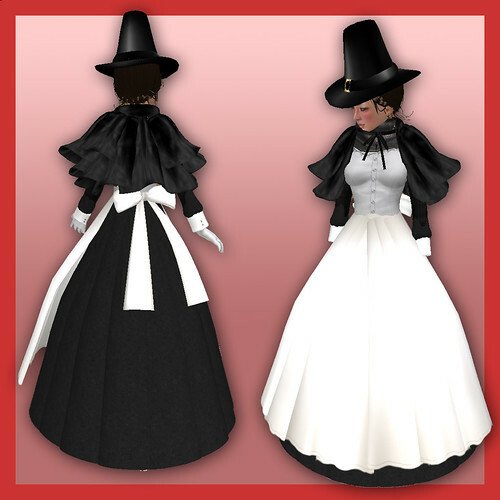 ***Cape: Kurotsubaki witch cape - hm, hope this wasn't seasonal. 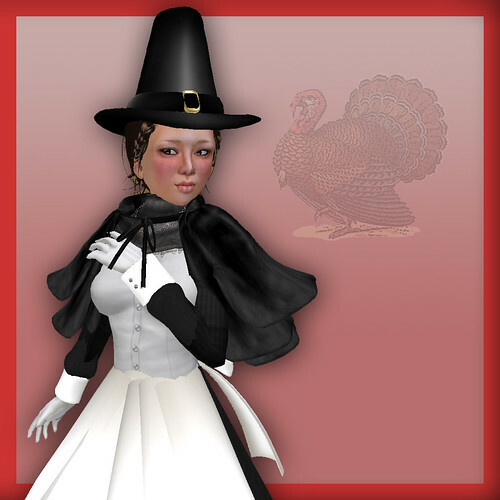 In the spirit of Thanksgiving, sending out a big "Thanks" for your blog - it's a daily must-read for me - thoroughly enjoy the way you weave your rl into your sl fashion commentary. Like Cyn, I love your blog, and it is a must read. Thank you! Happy Thanksgiving! You make the most adorable vixenish Pilgrim lady I've ever seen!